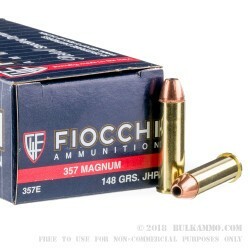 These excellent .357 magnum rounds are a great choice for self-defense that replicate popular 148 grain match loads. That particular weight is well-liked for its compromise between flat trajectory and massive terminal energy at appreciable distance. 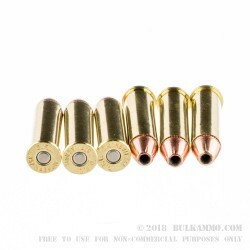 Each cartridge features a reloadable brass casing, a clean-igniting boxer primer, and a jacketed hollow-point (JHP) projectile which has a covered base and leaves very little lead residue behind in your carry revolver or home-defense lever-gun. The round's curved ogive and flat tip make it easy to load into cylinder and safe for storage in a tube magazine. This .357 JHP design uses a deep cavity with a shallow mouth that is situated in the bullet's exposed lead tip. Upon impact with a target, the projectile is designed to begin expanding in diameter which gives it a tumbling effect that creates a larger wound cavity than a conventional FMJ. While the bullet's toothed cannelure preserves accuracy under recoil, it also slows the rate of expansion during entry so that the projectile can fully penetrate into a target before slowing to a stop; this translates to momentum being delivered to a threat's vital organs in order to yield an efficient drop. 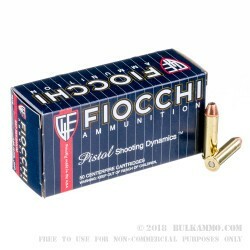 Fiocchi is an Italian company that maintains close relationships with many of their local firearms manufacturers as well as competitive shooters around the globe. This stream of real world feedback combined with a rich history dating back to 1876 allows them to manufacture excellent products for any purpose. 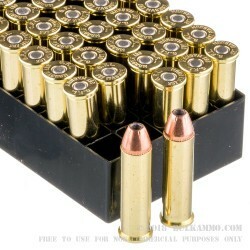 The bulk of their pistol ammo sold in the U.S. is also made in the U.S. using high grade components and stringent quality control processes.